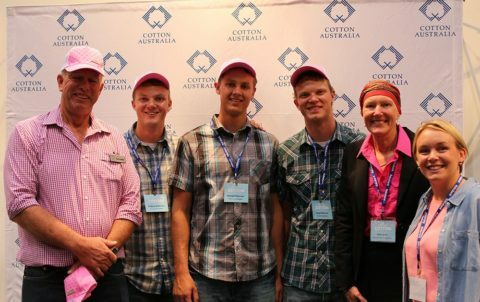 Organisers of the 2018 Australian Cotton Conference have posed themselves a mammoth challenge – to beat the 1,956 delegate registrations achieved in 2016 – which would make this year’s Conference the largest cotton gathering ever. To be held on Queensland’s Gold Coast from 7-9 August the program will focus on the theme “Pushing Boundaries”, providing ample opportunities to explore the challenges and potential of an industry at the cutting edge of agriculture. “Whether you’re a grower chasing extra yield, a cotton scientist pushing the limits of the plant or a manufacturer looking for new product performance, we’re all looking for ways to move beyond the boundaries for cotton,” Conference Committee Chairman and cotton grower Fleur Anderson said. “Together we will explore a huge range of issues, ideas and opportunities from a multitude of standpoints by not being afraid to have the difficult conversations and by hearing from world-leading experts from inside and outside the industry. “As a grower, the Conference always provides that extra bit of information or advice that you can take back to the farm to improve in some way. The Conference really is an experience and a great place to catch up with peers and friends as well,” she said. “This year we have a huge challenge to keep the program engaging and relevant in order to draw the record delegate numbers we saw last time. Our volunteer committee is working hard on the topics, presenters and social events that we hope will attract new and experienced growers and a diverse range of delegates from right along the supply chain,” Ms Anderson said. The Conference will kick off with a keynote address from international futurist Thomas Frey, whose skills at predicting the future for business and industries will provide a thought provoking start to the three day event. Also confirmed as a keynote presenter is Martina Jewell, UN Peacekeeper and author whose fascinating life-threatening experiences and insights into teamwork and leadership will be relevant to all delegates. “While we’re in the early days of planning, its likely we’ll cover topics like digital agriculture, dryland cotton production, global sustainability challenges and markets, succession planning, risk management and leadership,” Ms Anderson said. One of the largest Trade Shows in Australian agriculture with around 100 exhibitors provides a focal point for the critical networking and socialising that brings the industry together during Conference, as well as showcasing the new products and technologies taking Australian cotton to the next level. The Committee is determined to produce a Conference where there’s ‘something for everyone’, new delegates feel comfortable, families and the next generation are welcome and where the reasonable registration investment is well worthwhile. “All of that is made possible by the support of our sponsors and I am pleased to announce we already have major commitments from Foundation Partners CRDC and Cotton Seed Distributors,” Ms Anderson said. Conference registrations will open in early March. In the meantime to sponsor or book an exhibition space, please contact Brian O’Connell on 0413 130 777. The 2018 Australian Cotton Conference is hosted by Cotton Australia and the Australian Cotton Shippers Association.